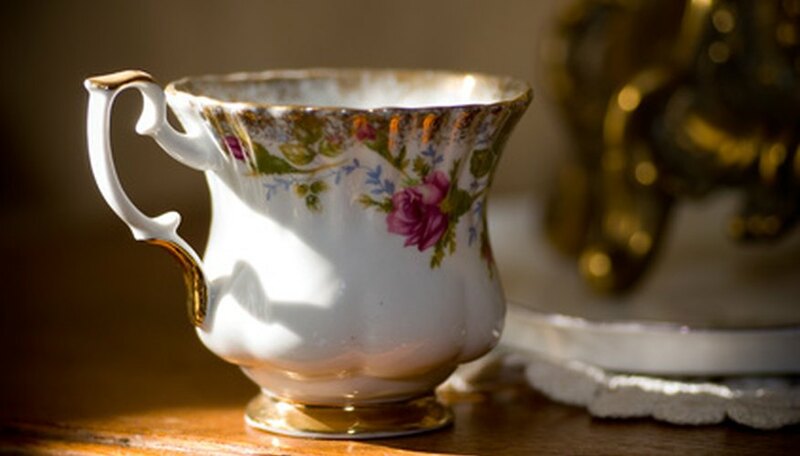 China cups and saucers can be made from pottery or earthenware, but most people consider cups and saucers made from porcelain to be true “china.” These cups and saucers may be painted by hand or stenciled and vary from plain and simple to elaborately decorated. Many china cups and saucers have marks from the company that manufactured them on the bottom of the dish. There are a few ways to identify the marks on porcelain cups and saucers. Turn the item over and look for a symbol or series of numbers, which can be matched to various companies that manufactured fine china. Some of these companies include Worcester, Spode, Minton and Crown Darby. Find a reference book of fine china at a bookstore, library or online to look up individual marks and match the mark to the manufacturer. An example of a reference book is “Hovel’s Dictionary of Marks 1850 to the Present.” There are also online resources on websites such as MyGrannysAtticAntiques.com or Marks4Antiques.com (see Resources). Identify the approximate age of the china piece by matching the mark style to the time period. Scrolls were commonly used between 1820 and 1860, while rectangles with initials were common between 1900 and 1932 and squares with rounded corners were common between 1950 and 1960. Look for symbols that were associated with different companies and/or a country. For instance, Dresden porcelain is commonly identified with a blue crown mark on the bottom of the pieces. Dresden pieces were made by different manufacturers in Dresden, Germany. Find china cups and saucers with a mark and the words “Rd No” or “Reg” and then a number, which indicates china made after 1884.